Were related to the benefit of better planning lumpectomies based on priory knowledge of the lesions’ size and location. The main challenge in using imaging as a tool for treatment planning is the devices’ specificity; i.e. the probability of identifying healthy tissue as malignant. The reason is the wish to avoid unnecessarily large excisions. When discussing the use of “popular” non-ionizing devises such as MRI in breast-imaging; e.g. my post introducing smart-imaging into radiologists’ daily practice I mentioned the low specificity of MRI in that respect. So, if one is reluctant to use ultrasound, for example due to its large inter observer variability and want to rely on the Mammography based work-flow, what new modalities are available? Stereoscopic digital mammography (SDM) uses a pair of digital mammograms, taken from slightly different angles and a stereo display workstation loaded with image-analysis software, to create a three-dimensional image of the internal structure of each breast. The resulting stereo image reveals more detail within the breast tissue than a standard two-dimensional mammogram. Purpose: To compare stereoscopic digital mammography (DM) with standard DM for the rate of patient recall and the detection of cancer in a screening population at elevated risk for breast cancer. Materials and Methods: Starting in September 2004 and ending in December 2007, this prospective HIPAA-compliant, institutional review board–approved screening trial, with written informed consent, recruited female patients at elevated risk for breast cancer (eg, personal history of breast cancer or breast cancer in a close relative). A total of 1298 examinations from 779 patients (mean age, 58.6 years; range, 32–91 years) comprised the analyzable data set. A paired study design was used, with each enrolled patient serving as her own control. Patients underwent both DM and stereoscopic DM examinations in a single visit, findings of which were interpreted independently by two experienced radiologists, each using a Breast Imaging Reporting and Data System (BI-RADS) assessment (BI-RADS category 0, 1, or 2). All patients determined to have one or more findings with either or both modalities were recalled for standard diagnostic evaluation. The results of 1-year follow-up or biopsy were used to determine case truth. Results: Compared with DM, stereoscopic DM showed significantly higher specificity (91.2% [1167 of 1279] vs 87.8% [1123 of 1279]; P = .0024) and accuracy (90.9% [1180 of 1298] vs 87.4% [1135 of 1298]; P = .0023) for detection of cancer. Sensitivity for detection of cancer was not significantly different for stereoscopic DM (68.4% [13 of 19]) compared with DM (63.2% [12 of 19], P .99). The recall rate for stereoscopic DM was 9.6% (125 of 1298) and that for DM was 12.9% (168 of 1298) (P = .0018). Conclusion: Compared with DM, stereoscopic DM significantly improved specificity for detection of cancer, while maintaining comparable sensitivity. The recall rate was significantly reduced with stereoscopic DM compared with DM. 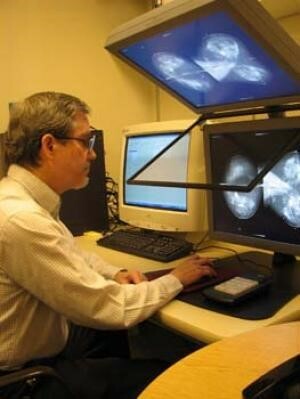 Digital Breast Tomosynthesis (DBT) entered the Breast-Imaging field few years ago. Early 2011, a digital mammography device by Hologic aimed at improving the specificity of mammography was approved by the FDA as a tool that may improve cancer detection while reducing the number of patient recalls. The DBT device takes 15 successive images, each at a slightly different angle along an arc across the breast. The concept is simple: What is hidden behind fibroglandular tissue in one image might be visible in another if the angle is slightly different (Figure bellow). Purpose: To assess cancer detection rates, false-positive rates before arbitration, positive predictive values for women recalled after arbitration, and the type of cancers detected with use of digital mammography alone and combined with tomosynthesis in a large prospective screening trial. Materials and Methods: A prospective, reader- and modality-balanced screening study of participants undergoing combined mammography plus tomosynthesis, the results of which were read independently by four different radiologists, is under way. The study was approved by a regional ethics committee, and all participants provided written informed consent. The authors performed a preplanned interim analysis of results from 12631 examinations interpreted by using mammography alone and mammography plus tomosynthesis from November 22, 2010, to December 31, 2011. Analyses were based on marginal log-linear models for binary data, accounting for correlated interpretations and adjusting for reader-specific performance levels by using a two-sided significance level of .0294. Results: Detection rates, including those for invasive and in situ cancers, were 6.1 per 1000 examinations for mammography alone and 8.0 per 1000 examinations for mammography plus tomosynthesis (27% increase, adjusted for reader; P = .001). False-positive rates before arbitration were 61.1 per 1000 examinations with mammography alone and 53.1 per 1000 examinations with mammography plus tomosynthesis (15% decrease, adjusted for reader; P < .001). After arbitration, positive predictive values for recalled patients with cancers verified later were comparable (29.1% and 28.5%, respectively, with mammography alone and mammography plus tomosynthesis; P = .72). Twenty-five additional invasive cancers were detected with mammography plus tomosynthesis (40% increase, adjusted for reader; P < .001). The mean interpretation time was 45 seconds for mammography alone and 91 seconds for mammography plus tomosynthesis (P < .001). Conclusion: The use of mammography plus tomosynthesis in a screening environment resulted in a significantly higher cancer detection rate and enabled the detection of more invasive cancers. Twenty-five additional invasive cancers were detected with mammography plus tomosynthesis — a 40% increase. Detection rates, including those for invasive and in situ can­cers, were 6.1 per 1,000 examinations for mammography alone and eight per 1,000 examinations for mammography plus tomosynthesis — a 27% increase. False-positive rates before arbitration were 61.1 per 1,000 examinations with mammography alone and 53.1 per 1,000 examinations with mammography plus tomosynthe­sis — a 15% decrease. After arbitration, positive predictive values for recalled patients with cancers verified later were comparable (29.1% with mammography alone and 28.5% with mam­mography plus tomosynthesis). Mean interpretation time was 45 seconds for mammography alone and 91 seconds for mammography plus tomosynthesis. 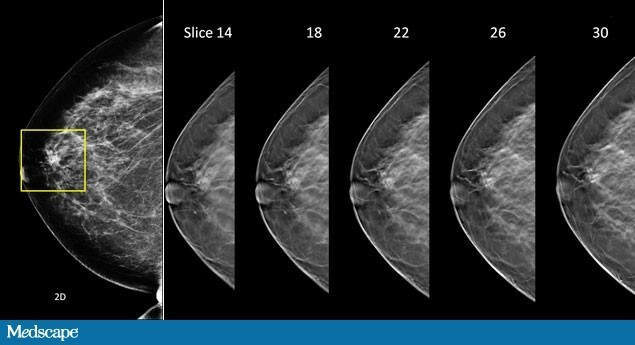 Purpose: To compare the diagnostic performance of breast tomosynthesis versus supplemental mammography views in classification of masses, distortions, and asymmetries. Materials and Methods: Eight radiologists who specialized in breast imaging retrospectively reviewed 217 consecutively accrued lesions by using protocols that were HIPAA compliant and institutional review board approved in 182 patients aged 31–60 years (mean, 50 years) who underwent diagnostic mammography and tomosynthesis. The lesions in the cohort included 33% (72 of 217) cancers and 67% (145 of 217) benign lesions. Eighty-four percent (182 of 217) of the lesions were masses, 11% (25 of 217) were asymmetries, and 5% (10 of 217) were distortions that were initially detected at clinical examination in 8% (17 of 217), at mammography in 80% (173 of 217), at ultrasonography (US) in 11% (25 of 217), or at magnetic resonance imaging in 1% (2 of 217). Histopathologic examination established truth in 191 lesions, US revealed a cyst in 12 lesions, and 14 lesions had a normal follow-up. Each lesion was interpreted once with tomosynthesis and once with supplemental mammographic views; both modes included the mediolateral oblique and craniocaudal views in a fully crossed and balanced design by using a five-category Breast Imaging Reporting and Data System (BI-RADS) assessment and a probability-of-malignancy score. Differences between modes were analyzed with a generalized linear mixed model for BI-RADS–based sensitivity and specificity and with modified Obuchowski-Rockette approach for probability-of-malignancy–based area under the receiver operating characteristic (ROC) curve. Results: Average probability-of-malignancy–based area under the ROC curve was 0.87 for tomosynthesis versus 0.83 for supplemental views (P < .001). With tomosynthesis, the false-positive rate decreased from 85% (989 of 1160) to 74% (864 of 1160) (P < .01) for cases that were rated BI-RADS category 3 or higher and from 57% (663 of 1160) to 48% (559 of 1160) for cases rated BI-RADS category 4 or 5 (P < .01), without a meaningful change in sensitivity. With tomosynthesis, more cancers were classified as BI-RADS category 5 (39% [226 of 576] vs 33% [188 of 576]; P = .017) without a decrease in specificity. Will Bio-Tech make Medical Imaging redundant? Thank you for this posts that brings together several studies exposing to the reader the frontier of Mammography technology and research. Stylistically, you reached perfection, thank you for maintaining the SOPs of this Open Access Online Scientific Journal. This post requires ONLY a link to be subchapter in the e-Book on Cancer.